Let’s just cut to the chase: The Force Awakens is a pretty good Star Wars movie. Some are saying great, but I’m not sure if a single viewing is enough. (And I don’t do rankings, because that’s tedious.) But the important thing, for our purposes, is that I enjoyed it. Granted, I’m an easy mark for this one. I’ve been a Star Wars fan for both the special editions and the prequels – I waited in those lines. (Briefly.) But I never approached any of them with anything beyond idle curiosity. They were not a cornerstone of my personal fandom. The Force Awakens is the first brand-new Star Wars film that’s actually important to me. The first film where I was actually a little scared to watch, because what if I don’t like it? In the theater, none of that mattered. UPDATE: Please do not leave spoilers in the comments of the review. We have a special discussion post for that sort of thing! I’ve got a new Unboxing Star Wars video up, with Yowie and I looking back at this past week in the world of Star Wars, with Star Wars Reads Day, the start of the new season of Rebels, some more Journey to the Force Awakens books, and of course we talk about the new poster for The Force Awakens. Yowie the Skunk, Baby Jawa, and Jawajames are back with another Unboxing Star Wars video! 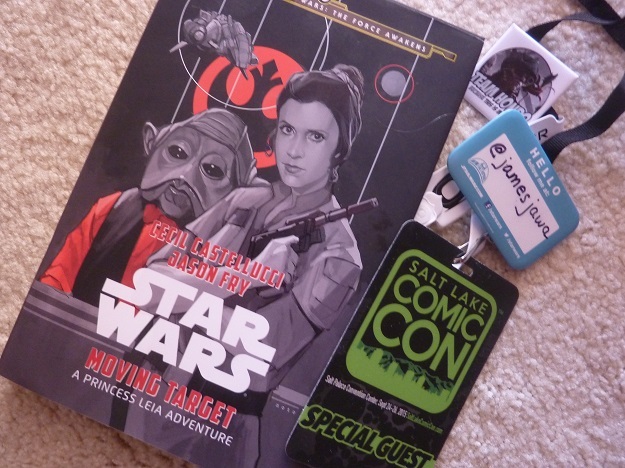 This time, we check out a BB-8 shirt, dive into the Journey to the Force Awakens book, Moving Target: A Princess Leia Adventure by Cecil Castellucci and Jason Fry, and also talk about what was cool in the world of Star Wars at Salt Lake Comic Con! For more on how Cecil Castellucci developed the character of Leia in Moving Target, check back to her Force Friday author appearance. Reviews of the Original Trilogy retellings: thumbs up! Over at BigShinyRobot.com, I’ve got reviews of this week’s new books for younger readers from Disney Lucasfilm Press. All three are great reads, taking the original trilogy films and telling them from new perspectives. → A New Hope: The Princess, the Scoundrel, and the Farm Boy by Alexandra Bracken is told in three parts, each from a different point of view as the three heroes recognize the simple labels they’ve got, and grow past them. Lots of great Leia stuff in the first third (including extra scenes), and Wedge makes a good appearance in the Luke section at the end. → The Empire Strikes Back: So You Want to Be a Jedi? by Adam Gidwitz put the reader square into the action by putting them in the role of Luke Skywalker. Great getting into Luke’s thoughts and emotions, plus lots of Jedi lessons at the end of each chapter to help readers become more mindful. → Return of the Jedi: Beware the Power of the Dark Side! by Tom Angleberger amps up the fun and excitement of Episode VI. More explosions, more sound effects, more Ewoks, and more funny footnotes! Plus witness the tragedies of Moff Jerjerrod and Romba! Chuck Wendig’s Aftermath is the first canon Star Wars novel to take place after Return of the Jedi since the old EU was declared Legends more than a year ago. I’ve only formally reviewed the lackluster Heir to the Jedi since then, but it’s no secret that the canon novels so far haven’t been to my tastes. My focus has never really been on books set during the film eras, and before Aftermath all the offerings were just that. But I am pleased (and, yes, a little surprised) to report that I found Aftermath to be rather good. You’ll hear a lot about Wendig’s unusual style of prose – and I had some hesitation there as well – but I found that once I got into the rhythm of the book it was no trouble at all. In fact, this is the first canon novel I didn’t have to force myself through at all – it read speedily and offers a satisfying story with interesting characters. But they are, for the most part, new characters. Wedge Antilles plays an important part, but you can’t call him a lead by any means. Rebel pilot Norra Wexley, her son Temmin, former Imperial loyalty officer Sinjir Rath Velus, bounty hunter Jax Emari and Imperial Admiral Rae Sloane (who originated in A New Dawn) carry most of the plot’s weight. Only minor spoilers, if that, beyond the cut. Video: Force Friday Countdown: Force Wednesday! Jawajames, Yowie the Skunk and Baby Jawa are back at it again! They take unboxing Star Wars stuff very seriously in today’s video for Force Friday Countdown: Wednesday. This time, they review Star Wars fruit snacks; DK’s Ultimate Star Wars by Tricia Barr, Adam Bray, Dan Wallace, and Ryder Windham; and Adam Gidwitz’ retelling of The Empire Strikes Back: So You Want to be a Jedi?. Need more info on Ultimate Star Wars? James has a Q&A with Tricia and Adam and a follow-up interview with Adam from this past May. And if you missed it, check out their first video from Tuesday. Jawajames is back with a new Star Wars unboxing video. Undeterred that he wasn’t selected to be one of the official unboxing hosts for Force Friday, he’s rounded up some recent and upcoming Star Wars products to review with his co-hosts, Yowie the Skunk and Baby Jawa. Reviews include Star Wars cereal, Dark Disciple by Christie Golden, and the upcoming retelling of A New Hope: The Princess, The Scoundrel, and the Farm Boy by Alexandra Bracken. Kevin Hearne’s Heir to the Jedi brings a lot of firsts, as far as Star Wars novels go. It’s the first of the new canon novels to feature one of the big three characters; the first Star Wars first-person novel* to feature an actual movie character, and the first canon novel to be set after A New Hope. It’s also the first of the new novels I actually had any interest in reading. Now, I don’t expect a Star Wars novel to rock the very galaxy, particularly when set in a movie-limited era like this one is. I wasn’t expecting a game-changing book by any means. And generally, I don’t mind a quieter story, as long as it’s an engaging one that keeps me wanting to read. Unfortunately, Heir to the Jedi delivers an unremarkable tale that fails to make much of an impression. From the first-person conceit to the title that seems deliberately reminiscent of Heir to the Empire, it seemed to me like the book was writing several checks that it completely failed to cash. Yowie and I got our hands on a copy of Imperial Handbook: A Commander’s Guide and we share the awesomeness of opening up the deluxe version, with its electronic protective case and accessories. The look and feel of this book is top-notch, with annotations by the various Rebels written in the margins, and some luxurious artwork. The Imperial Handbook, like its predecessors, The Jedi Path, Book of Sith, and The Bounty Hunter Code, is full of great detail on the organization of the Empire’s military. With sections about the army, navy, and stormtrooper corps as well as chapters on Imperial doctrine, there’s plenty of stuff for a fan of the Empire to learn, and some good comments from various Rebels about the Empire (including some snark from Han Solo). Fans of the Empire should enjoy this one, even if it is considered Legends. Imperial Handbook is written with great detail and some awesome illustrations and schematics. There’s some propaganda style artwork as well as detailed drawings of Imperial war machines. If you’ve ever wondered what the rank badges are in the Imperial Navy, about the different training academies for stormtroopers, what General Madine recalled from his days as an Imperial, or how the Emperor inspired his command staff, this book is for you! An advance copy of this book was provided by Becker & Mayer! for review.